A celebration is planned Thursday for the $3.6 million, 1.25-mile protected bike lane, which has been opening in phases this year. 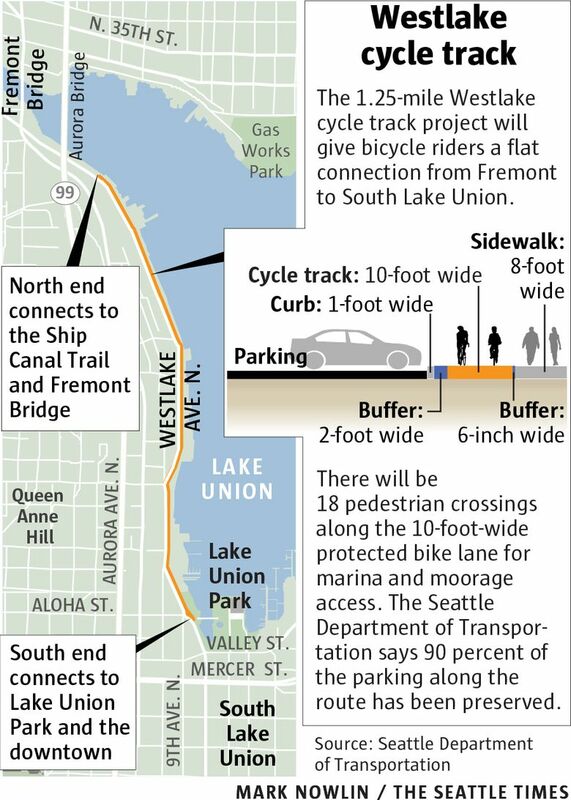 A grand-opening ceremony is planned Thursday afternoon for the Westlake protected bike lane, which extends from the Fremont Bridge to South Lake Union. The Seattle Department of Transportation completed the final, southern segment this week, after opening other phases this year. Much of the path is painted green or runs near sidewalks. Thursday’s party is at Lake Union Park, next to the Museum of History & Industry, from 4:30 to 6:30 p.m., including a 5:30 p.m. group ride. The $3.6 million, 1.25-mile project connects to an existing walk-bike path near the bridge, and it gives an alternative to riding on hilly Dexter Avenue North, or amid fast cars on four-lane Westlake Avenue North. But it also has made business owners and houseboat residents wary about the loss of parking space, as well as dangers posed by fast cyclists. A 130-member Westlake Stakeholders Group appealed the city’s plan but dropped its opposition in 2014. The final design removed 10 percent of parking spaces, leaving 1,124 city-owned free and paid stalls in the area. Bicyclists for years pedaled through parking lots with poor visibility near lakefront businesses, leading to occasional low-speed collisions with vehicles. Police responded to seven bicycle crashes in the lots, and six on Westlake Avenue itself, from 2007-14, according to city data mapped by The Seattle Times. No speed limits are marked on the new bikeway, but city codes require riding in a “careful and prudent manner,” and a voice or bell to alert pedestrians.